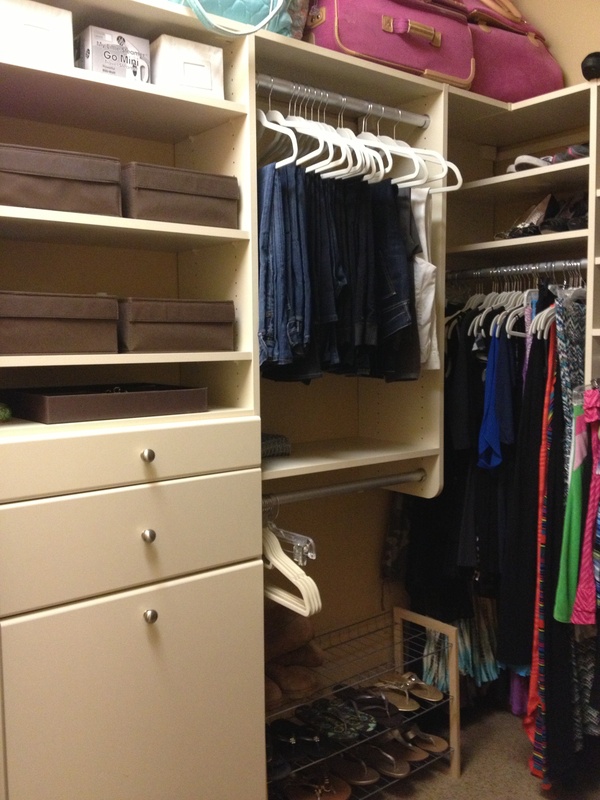 Today's more ways is around closet organization, where there are always more ways to set-up your wardrobe; giving you the best use of your closet space. If you want to maximize your space, the best place to start is in the space, taking the time to objectively examine what works and what doesn't work. Do you like to organize by style or cut? Great. Do you like to color-coordinate so you see all your pink or all your green options? Awesome. Do you like to turn your hangers like a question mark or do you find all your hangers are "ridin' dirty," hung every-which-way so long as they hold a dress and fit into the rack? Questionable. Often what doesn't work and what is more of a hassle will stand out the most and move mountains when you change it. 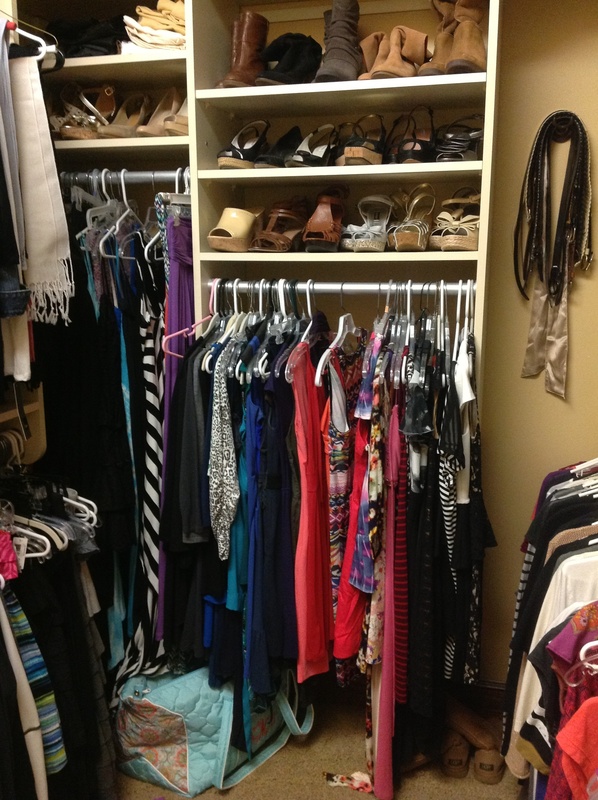 Short example: a life-friend of mine shares her closet with her boyfriend; her clothes lining the right side of the wardrobe. Most of her clothes have some sort of "interesting detail" or "unexpected twist" (a lace collar, a splatter-painted pocket, a cool design along the front right-side, etc.) that distinguishes one item from another. 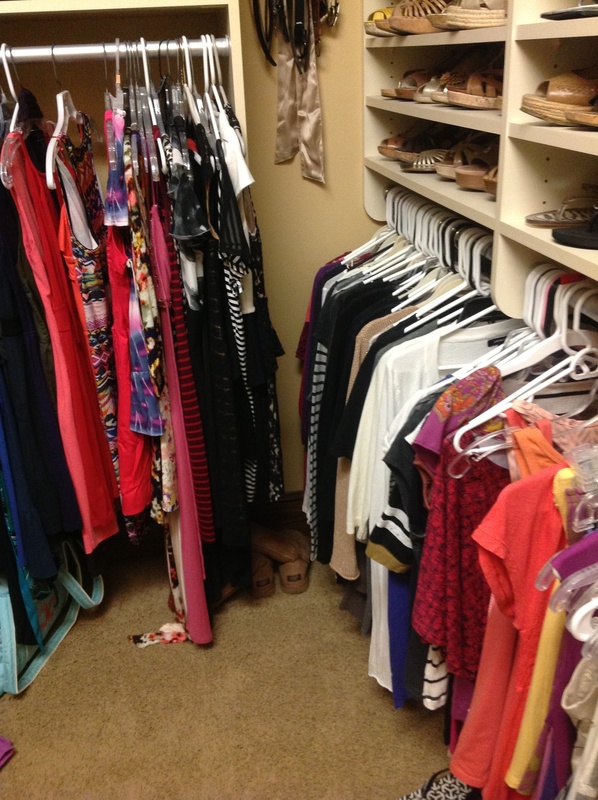 Problem was, since all her clothes were hung to face the back of the closet, she could rarely see these details and thus not know the full-extent of her closet. She would grab the stuff she usually grabbed and miss the beautiful details of something else, simply because it wasn't in sight. Out of sight, out of mind. 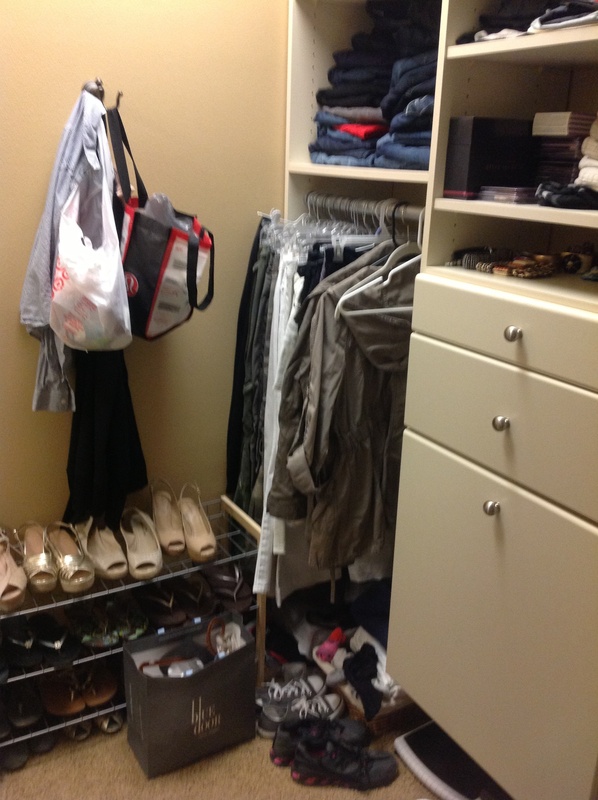 After we edited her closet, we turned all the hangers to allow each piece to face the entrance of her closet. That combined with the new space she had was a breath of life to her wardrobe and allowed her to create with more pieces. It was like asking Picasso to paint with 12 colors instead of 2. Pure genius & endless possibility! Below is after we purged. Which then became the "mid way" point (you'll see why soon). After 5 hours of work, Karen was entusiastic about completing this job with organization that was going to work for her and her new space. Literal and physical, spaaaace. On her own and in her own way, Karen took a trip to Target and spent the rest of her evening creating the closet of her dreams. 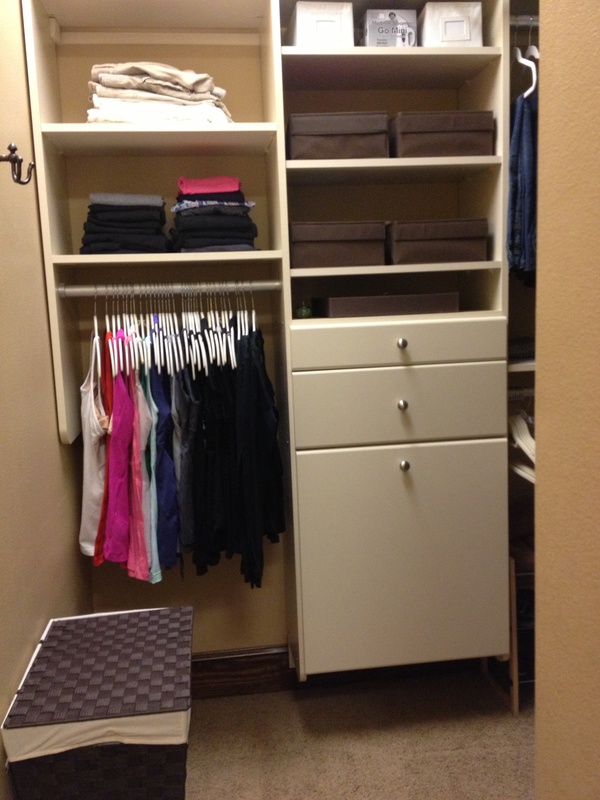 When you get "the bug" to keep going and to personalize your closet space, the result is spectacular! 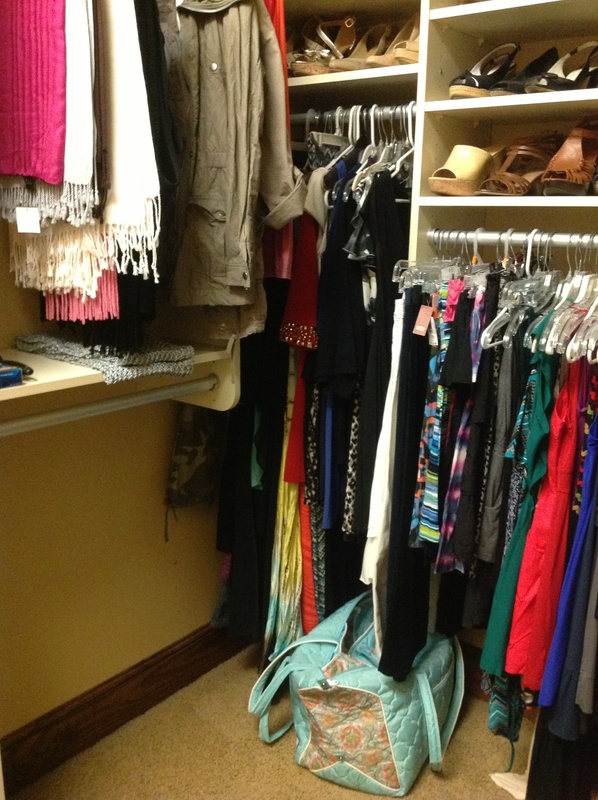 The best part about getting the most out of your closet is the result afterward. Karen was keeping her workout clothing in a drawer in her bedroom, yet it was the pieces she needed to grab quickly and wear the most. 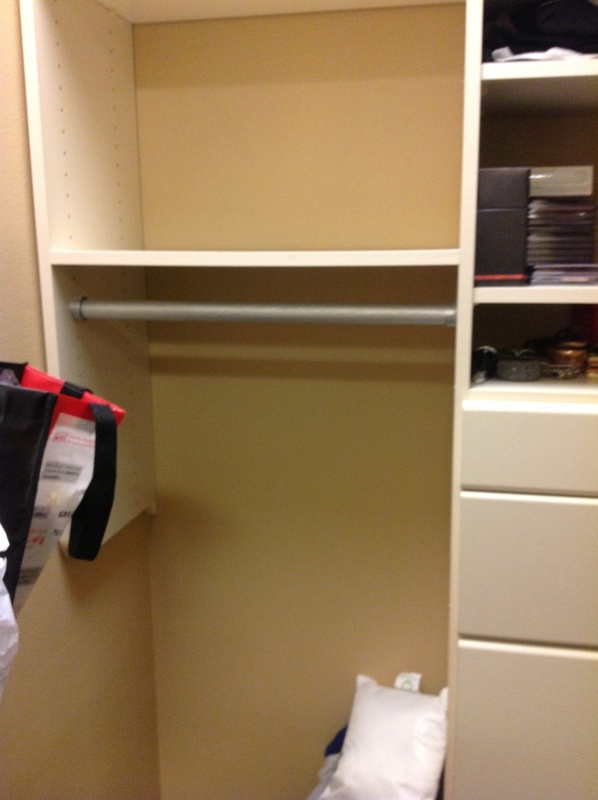 Now they are all visible, some hung, and the first section of her closet. When you have room you never had before, the goal is to keep that room. Keeping that room just means being more intentional with the space you do have. What will you do to make the most out of your space? Take notice of easy changes, simply based on the way you use your individual space.